Rome, Italy — While we wait for more results in the Italian election, let’s take a moment to recall why Berlusconi has made this such a competitive race, much to the chagrin of world markets, Brussels, and Angela Merkel. As part of Italian “reform” plans, Mario Monti instituted a fairly modest tax on every home that Italians own. The tax is called the IMU. Previously the tax was only on second homes. The whole tax is not that big. The state only takes in 4 billion EUR per year. But Berlusconi made it a big deal by promising to refund the whole thing he wins. Everybody hates taxes, so this obviously is an appealing promise. OK, you say, what politician doesn’t promise to give voters free money? How is that novel? This gets to a deeper point. As some people who work for Berlusconi’s party explained to me, the whole premise of the Berlusconi campaign is a rejection of Brussels imposed rules on Italy. This tax was the ultimate move where Monti went against the majority of the people (Italy has a huge homeownership rate) in order to do something that Brussels favoured. By promising to refund the tax (and in recent days, promising to refund the tax via his own wealth!) 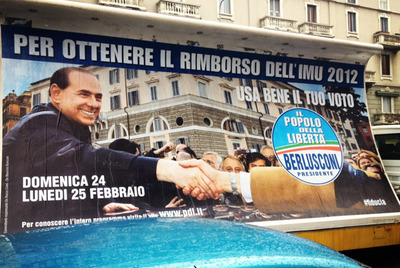 Berlusconi simultaneously promised voters free money, and helped define the election as Brussels vs. non-Brussels. If you’re sceptical that reimbursing the IMU was the defining aspect of the campaign, check out the title on this Berlusconi billboard outside of his Milan HQ.